There are many reasons why it is important for horses to know how to execute a flying lead change. The ability to change leads at the canter without dropping to a trot will help jumpers balance correctly as they move around the hunt field. This ability is also critical to the success of horses competing in speed events like pole bending and barrel racing. The key to successfully teaching your horse the flying lead change is to make sure you have all the fundamentals tackled before you begin. Make sure your horse has all the fundamentals in place before you attempt to teach the flying lead change. Before you begin, make sure your horse is consistently picking up the correct lead at the canter, and be sure he is moving in a balanced and fluid manner. Before you begin working on advanced training like flying lead changes, make sure your horse is comfortable and relaxed under saddle, and that he responds readily to cues for walk, trot, canter and of course, whoa. Canter a large circle in your arena or other suitable riding area. Make sure your horse is moving properly on the correct lead. 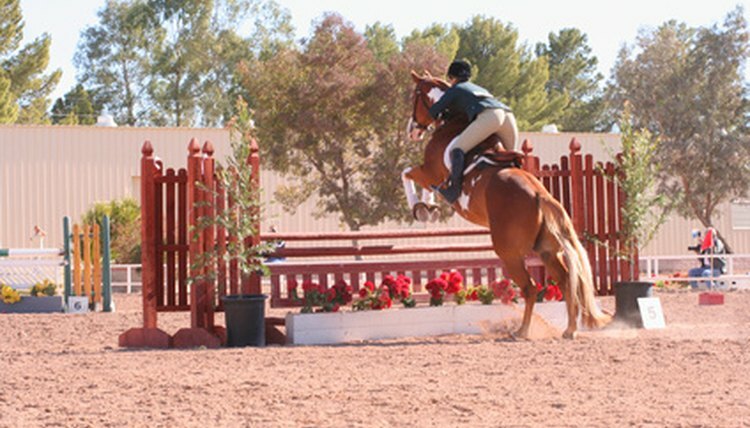 Canter a few large circles, then break to a trot as you approach the middle of the arena. Trot as few steps as possible before cuing your horse for the opposite lead. As you cue for the canter, shift your weight slightly to the outside and pick up slightly on the inside rein. Continue to work on these simple lead changes, slowly reducing the number of trotting steps. When you feel your horse is ready, shift your weight slightly to the outside and cue for a lead change with the opposite leg. For instance, if your horse is cantering on the left lead and you want to change to the right lead, you would cue with your left leg. Be patient when teaching your horse the flying lead change. For some horses, the flying lead change will come quite naturally, while for others it may be more of a struggle. If your horse is not progressing, it is important to drop back to simpler maneuvers, such as simple lead changes and large sweeping circles. Your horse will need to be well balanced, with a strong back and hindquarters, in order to execute flawless flying lead changes every time.